Born in 1727 in the Val-de-Travers, Ferdinand Berthoud was one of the pioneers of marine chronometry, a discipline calling for extreme precision. A visionary watchmaker, daring researcher and acknowledged theoretician, he earned the title of “Master Horologist” in Paris in 1753, at the age of 26, and was to make an indelible imprint on history through his inventiveness and his talent for mechanics. His ultra-precise marine chronometers made it possible to calculate longitude to the nearest half-degree and to conduct the great scientific explorations and cartography campaigns of the 18th century. 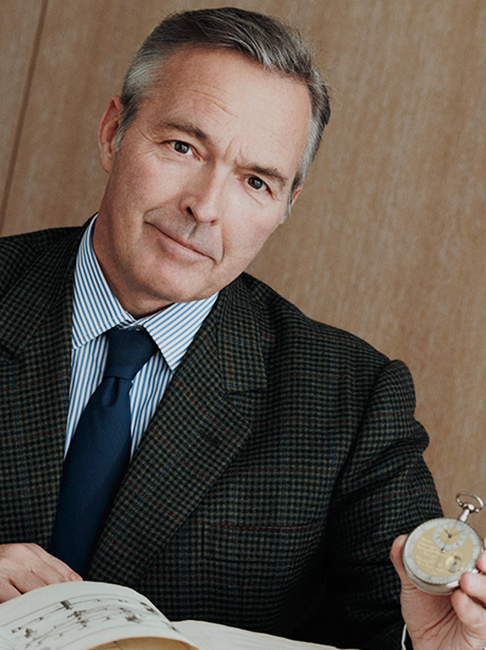 These horological feats earned him the much-envied title of Clockmaker and Mechanic by appointment to the French King and the French Navy under Louis XV. The DNA of the new timepieces produced by Chronométrie FERDINAND BERTHOUD stems from the considerable heritage of the Maison. These contemporary yet timeless watches are endowed with the signature touches embodying the excellence and the renown of the Berthoud dynasty. Precise, complex and elegantly understated, they symbolise the natural continuity of creations by Ferdinand Berthoud. 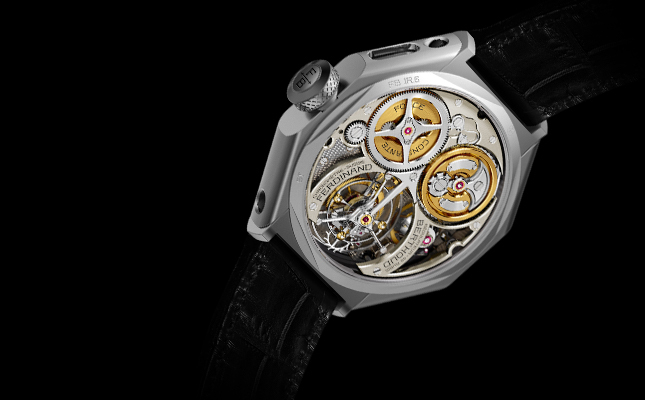 Their innovative mechanical movement, entirely developed, produced and assembled in-house, displays a characteristic pillar-type structure graced with refined finishes and housed within a distinctive octagonal case. Through its design and its COSC-certified calibre with tourbillon and constant force, the 1785 edition of the FERDINAND BERTHOUD FB 1R Chronometer is inspired by Ferdinand Berthoud’s Marine Chronometer No. 7. Integrated within a pillar-type architecture, the fusee and the barrel of the transmission system are reversed and suspended. The 280 mm long chain connecting them supports a tension of three kilos exerted once winding is complete. 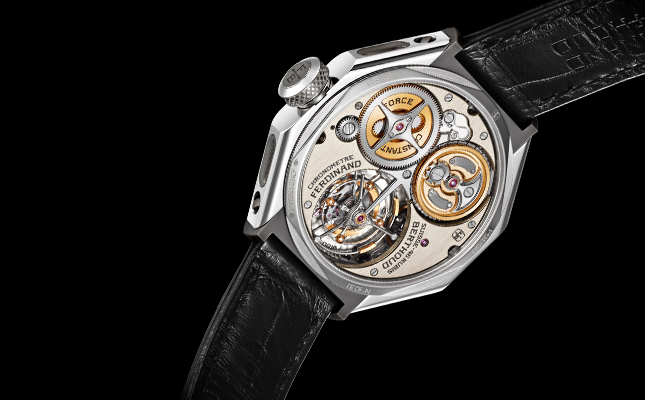 The result of complex scientific calculations, the power reserve consists of a unique mobile cone connected to flat levers on the dial side and reflects the barrel’s various states of winding and unwinding with unparalleled precision. This exceptional timepiece is offered in a numbered five-piece limited edition, carved in bronze, each with a different patina to evoke the passage of time. Inspired by the Marine Chronometer No. 7 that Ferdinand Berthoud produced in 1767, the construction and the regulator-type display of the FERDINAND BERTHOUD FB 1R.6-1 chronometer overturn traditions. 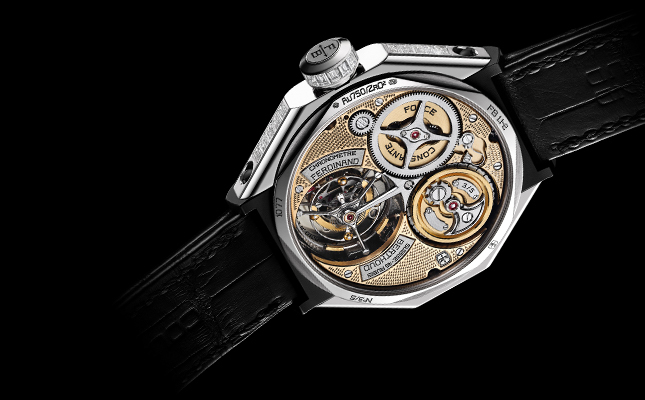 Composed of the rear side of the black rhodium-plated nickel silver regulator plate adorned with straight-grained lines, the dial features three openings: one for the hours (at 2 o’clock), another for the minutes (at 12 o’clock) and a third for the power reserve (at 10 o’clock). The FB-T.FC.R calibre, with its pillar-type architecture, features a direct-drive centre seconds tourbillon whose constant force is provided by a fusee-and-chain transmission mechanism incorporating a satellite differential gear and Malte Cross stopwork device. Continuing the tradition of precision inherited from Ferdinand Berthoud, this COSC-certified timepiece is available as a 20-piece limited edition in carburised steel. Issued in an exclusive five-piece limited edition, the “Oeuvre d’Or” collection pays tribute to its principal source of inspiration, the astronomical pocket watch No. 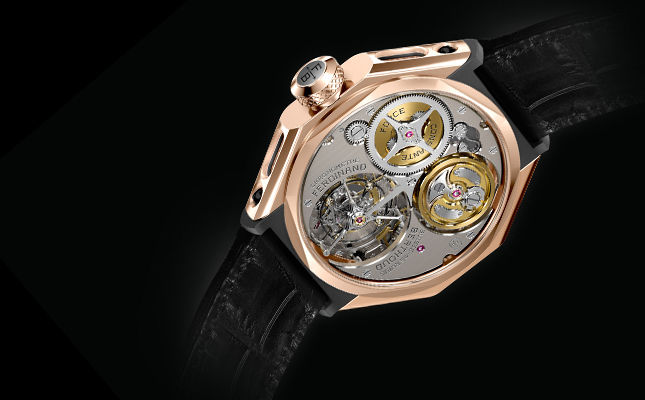 3 from Ferdinand Berthoud. 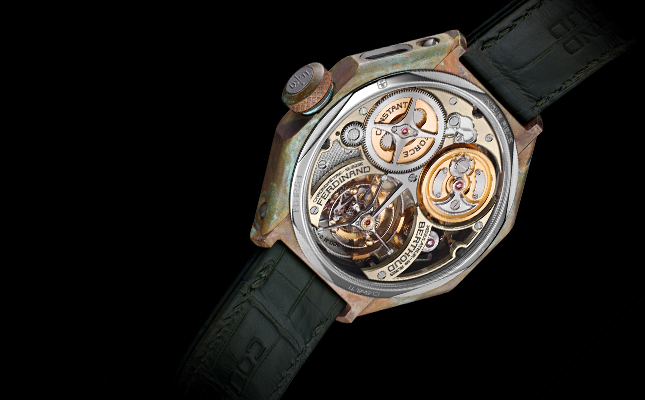 Its main components are adorned with original decorations: while the dial is finely crafted to obtain an aged patina, the half bridges of the movement also highlight the know-how of the Manufacture’s engravers with their hand-made “pyramid” motif decoration. Both are entirely crafted in 18-carat yellow gold and come with a gemset 18-carat white gold case housing the tourbillon movement with fusee-and-chain transmission system, directly inspired by Ferdinand Berthoud’s creations from the 18th century. The concept of the FERDINAND BERTHOUD FB 1.4 Chronometer is inspired by an 18th century armillary sphere whose movement, created by Ferdinand Berthoud, indicated the time on a glass dial. The sapphire half-bridges reveal the beauty of the hand-wound Calibre FB-T.FC-2, rhodium-plated and dotted with blue accents, its pillar-type architecture and its reversed and suspended fusee-and-chain transmission mechanism. Thanks to its titanium case, this timepiece with its contemporary design weighs only 80 g, which is extremely light for such a complex timepiece. The FERDINAND BERTHOUD FB 1.4 Chronometer is produced in two 20-piece series, a symbolic figure linked to the history of Ferdinand Berthoud, who received an order in 1770 for 20 marine chronometers that would make a vital contribution to the success of major exploration campaigns. 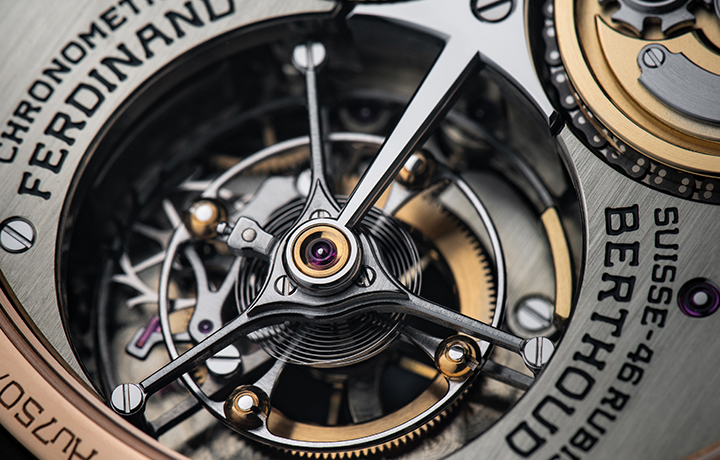 The Chronomètre FERDINAND BERTHOUD FB 1.3 chronometer was born from Karl-Friedrich Scheufele’s passion for time-measuring instruments and is inspired by the Marine Chronometers that Ferdinand Berthoud created in the 18th century. With its pillar-type construction and its direct-drive centre seconds, its unique Calibre FB-T.FC is the thinnest in its class. Its fusee-and-chain transmission mechanism is equipped with a barrel featuring with Malte Cross stopwork device and a fusee with satellite differential gear system. The power-reserve mechanism consists of a suspended mobile cone. 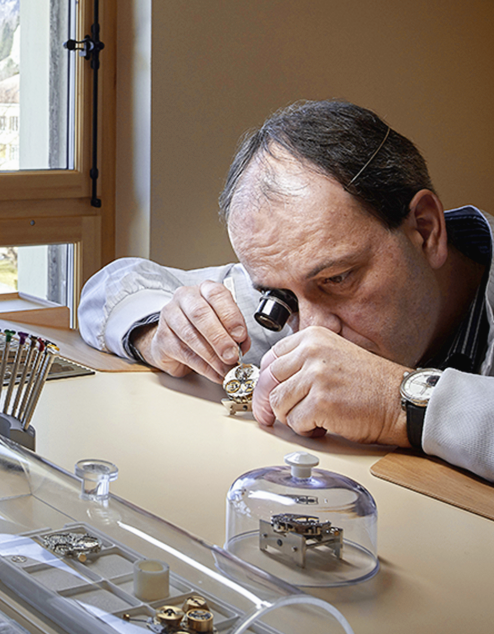 Whether straight-graining on the dial or mirror polishing on the tourbillon bridge, the finishes are entirely hand-crafted using traditional tools and quality controls are carried out under a 6x loupe. Issued in an exclusive 50-piece series, the Chronomètre FERDINAND BERTHOUD FB 1.2 is the first model in the collection. Its vertical satin-brushed black dial is framed by an octagonal rose gold case with a black ceramic inter-horn space. Its sides feature four watertight portholes revealing the intricate workings of Calibre FB-T.FC with its pillar-type architecture. The transparent sapphire case-back provides a chance to admire the 1,120-part tourbillon movement with fusee-and-chain transmission. Four patent applications have been filed for certain mechanisms of this COSC-certified movement. Both contemporary and technical, this exceptional model reinterprets the mechanical prowess and extreme precision of the Marine Chronometers that Ferdinand Berthoud produced in the 18th century for the French King and Navy. Issued in an exclusive 50-piece series, the Chronomètre FERDINAND BERTHOUD FB 1.1 is the first model in the collection. Its vertical satin-brushed ruthenium dial is framed by an octagonal white gold case with a black titanium inter-horn space. Its sides feature four watertight portholes revealing the intricate workings of Calibre FB-T.FC with its pillar-type architecture. The transparent sapphire case-back provides a chance to admire the 1,120-part tourbillon movement with fusee-and-chain transmission. Four patent applications have been filed for certain mechanisms of this COSC-certified movement.